This is a really long update as it grew out of control like wildfire. I hope you enjoy reading it as I digressed far from the target message. Besides I’m old and allowed to digress. Next step in my age progression is to have a cane, talk incoherently to myself as I cross the street, and then beat the hell out of a car that’s too close to me while I’m in the crosswalk. I actually saw this exact incident happen in front of one of my Taco Bells in the 1980s. I laughed so hard I almost wet my pants. Crotchety old men are allowed literary and eccentric license and I’ve got the literary license today. I’ve had the eccentric license since I was a teenager. If you aren’t interested in what a nerd I was (am) and how I became a brain-washed Apple borg collective, scroll down to “What’s Happening”. This doesn’t have anything to do with the stock market but it does tie into Apple stock and their computers. All in all, this gives you a little background on the fearless, nutty goof-ball nerd that’s writing this blog. In my old age I’ve become relatively conservative (compared with earlier decades). Of course I realize that conservative is a relative concept. What’s conservative to me is certainly wacko to someone else. To each their own because that’s what makes the world interesting. I built my first computer from a kit in 1977. That’s right, I assembled it with my trusty soldering iron and a whole lot of time and patience. This was 4 years before the introduction of the IBM PC in 1981. Personal computers were just beginning with some of the key nerds of that time, people like Bill Gates, Steve Jobs and Woz. Too bad I never hooked up with any of them but I wasn’t in the right place at the right time. My Cromemco computer had only 1 floppy disk drive as I didn’t see any need for a second floppy drive (that was short-sighted of me). 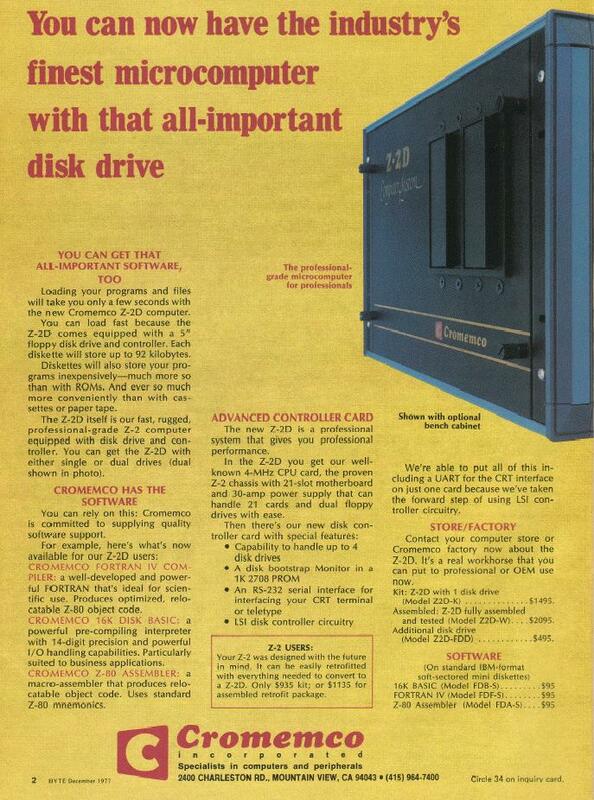 A hard disk drive was too expensive that only mainframe computers had them. It was two computers later before I had a hard disk drive. 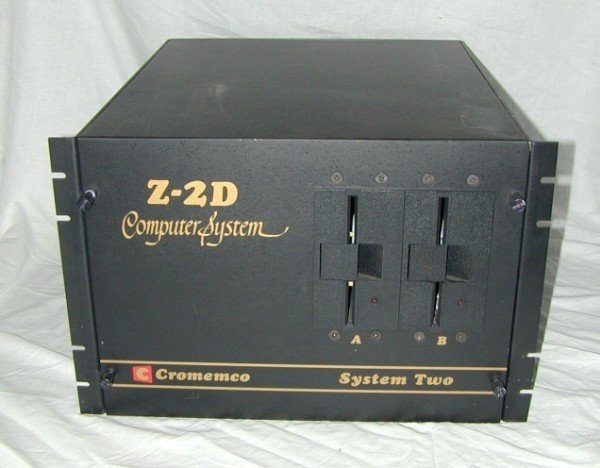 The Cromemco came in a big ugly black case that was large and heavy (13″ high x 20″ wide x 26″ deep and 36 lbs). It had 21 slots for the S-100 buss (that’s was really overkill). 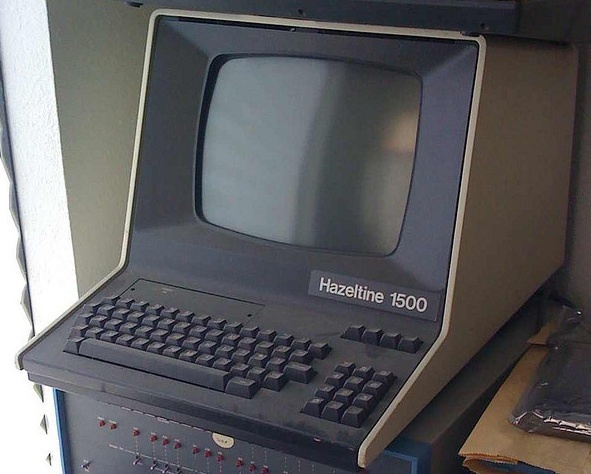 This computer continued to serve me well until I decided to buy a PC clone in 1983 . I spent over $4,000 on the Cromemco, which included peripherals. Each of the four 16K memory cards cost me $500. Today a 16K chip (not a board, a chip) would cost about a buck. I doubt if you can buy a 16K memory chip anymore (insignificantly small capacity). That $4,000 price tag in 1977 translates into $15,500 in today’s dollars. That shows the tremendous progress they’ve made in cheaper computers. The first program completed was a profit and loss statement for the Taco Bell restaurants. After that came a payroll check writing program, which was followed by the payroll report programs, which were due quarterly and yearly for both the state and federal government. What a time saver it was. I spent about a solid year writing these programs so that I could save a whopping 2 or 3 hours each month doing tedious business activities. It really was a great challenge and I triumphed in the end but I would never come close to recovering the time that I had spent writing these programs. But there was a side benefit because it did lead to some discoveries that were unanticipated in the stock market. Here are the two issues of Popular Electronics that started the nerds thinking about computers. This DecWriter printer below was so clatteringly loud that I installed it in a closet and kept the door closed. It was a dot matrix printer (remember them???) and printed at the blazing speed of 30 characters per second. That may sound fast but it took several minutes to print one page. Today my laser printer will churn out 12 pages per minute. I also had a 300 baud telephone modem for dial-up connection to outside computers. 300 baud is about 30 characters per second and it was agonizingly slow. One day I had a eureka moment. With a computer I thought I could undertake a lot of studies of the stock market that I never thought possible, plus I could program it to print charts. Here I went again, spending endless hours in front of the computer creating new programs. I was in so much trouble with my wife because I practically didn’t exist in the family anymore. I was just this blob that said “huh” to everything. Also, “Just tell me when dinner is ready and I’ll come”. “Yeah sure, get it yourself”. “Chrissi and I are going out to eat”. And so it went. She eventually murdered me, disposed of the body in the desert and I was replaced with a look-alike android that paid her more attention. Androids were really expensive in those days. Truthfully I was really lucky that I had an understanding wife as a lot of women would have really unloaded on me and I would have certainly deserved it. 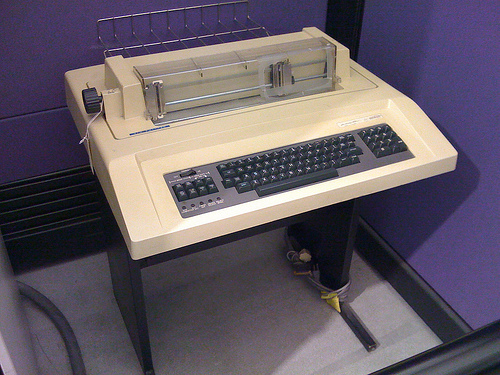 In 1981 when the IBM PC came out, I was unimpressed by it but a couple of year later I did buy a PC clone with lots of bells and whistles that were lacking on the IBM. For the first time there was now software available for this useless pile of semiconductors called a computer. Computers are really nothing more than a large doorstop without the software. The Apple computer preceded the IBM PC but it had very, very little software available and this would remain true for a very long time. I vowed that there was no way I would ever buy an Apple computer because software is the heart and soul of a computer. When the original Mac came out, it did look interesting if you were into desktop publishing or something similar that involved graphics. My continuing direction was towards custom financial software that I wrote myself for my business and stock market analysis. There was nothing Apple had to offer that interested me. And so it continued for literally decades. Not long after Bootcamp’s introduction (2008) I went to my local Apple store and fell in love with an iMac. I bought it and proceeded to use it for my Windows applications and also Apple applications. Things were so good that after a year I had almost completely abandoned my Windows software. Better still, the iMac operating system was so stable that I never saw the blue screen of death or its related Apple counterpart (does it exist???). No rebooting because things froze up or whatever else that might go wrong with PCs. I now started talking to friends about my Apple computer and how they had to buy one too. I was the proud owner of an iMac and had become a full fledged member of the Apple club. These were unbelievable words coming from my month, an avowed hater of Apple computers. A year later I bought a MacBook Pro (laptop) and was now a two computer owner of Apple products. My Apple brainwashing was almost complete and evidently I was turning into a mindless Apple borg collective member. The Amazon Kindle came out and I had to have one, loved it but it didn’t do some things that I would like to see done by a small device like this. Boom, Apple announces the iPad and it does everything the Kindle does and LOTS more. I quickly sold my Kindle on eBay before the iPad was introduced and Kindle prices dropped because the world was going to wake up one day and realize that the Kindle wasn’t up to the job and expendable. I bought my iPad on the second day they were available (Monday after Easter 2010). I was now a 3 computer owner of Apple products. It’s official, I was now an Apple zombie, “me want more Apples”. And here we are at present day, awaiting the arrival of the iPad 3. I will be buying an iPad 3 because I want the new features so widely rumored. I theorize that there are a LOT of other people that are thinking exactly like myself. They have an iPad 1 and want to trade up because the new features will be too advanced to pass up. Try to find an unhappy iPad owner. They “almost” don’t exist. Now I don’t participate in first day activities with all the Apple devotees who can be a little bit crazy with their borg-type devotion. But I think it’s highly likely that the iPad 3 demand will exhaust the available supply on the first day . Second day buyers and beyond will be left with nothing but an order to be filled at a later date. On black Friday (Friday after Thanksgiving) the iPhone 4S was sold out throughout the country. There is obviously precedent for huge demand overwhelming supply. With this in mind, I must become part of the day one problems but I won’t be part of the opening craziness. I’ll be there about 2 hours after the open when the opening crazy rush is mostly finished (I hope its finished). It seems likely that there should be iPads available throughout most of day one. Hopefully that better not be wishful thinking or I’ll be standing in line waiting for nothing (yuk). With all of this in mind, it seems extremely likely that Apple will have another blowout quarter of earnings propelled by the iPhone 4S and the new iPad 3. Apple’s guidance for the first quarter of 2012 was well above analyst’s expectations and that never happens. Apple ALWAYS predicts very conservative numbers that are easy for them to hit. So first and second quarters are very likely going to be sensational. Earnings for 2012 should be nothing short of spectacular. Apple TV (the actual televisions made by Apple) are rumored to also be coming in 2012. These will be top of the line televisions that you will speak commands (Siri) and they will do everything you want with no remotes cluttering your tables. The downside of these TVs will be price but as usual everything Apple makes is first rate and not the cheapest when compared to others. Apple has no peers when you compare features, only competitors that try to catch up and mimic last year’s Apple product and never quite catching up to Apple. The stock price of Apple has had a very nice run since its consolidation around the $350-$360 level during the 4th quarter of 2011. The recent run up of about 150 points (over $500 presently) from $350 has been prompted by much better earnings than anticipated during the 4th quarter. This was caused by the blowout sales figures for the iPhone 4S plus the recent and long awaited announcement that the iPad 3 will be unveiled during the first week in March. Apple now has 100 billion dollars in cash. That’s a lot of money. 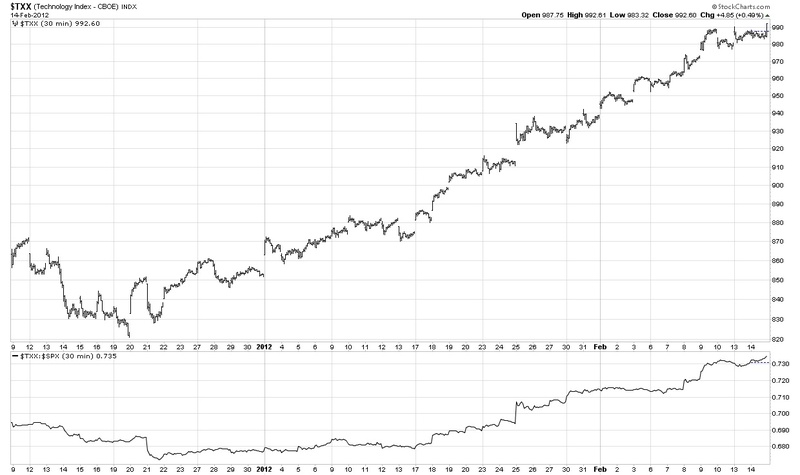 I think Apple’s new price over $500 per share makes Apple the most valuable company in the world eclipsing Exxon. I think it’s very likely that Apple will begin paying a dividend this year. Apple could pay a 4% dividend and still increase their cash reserves. A more likely figure for a beginning dividend is something on the order of 2% per year. Steve Jobs was never in favor of paying a dividend but Cook is amendable. One of the problems that Apple has is that many institutions have hit their limit on the amount of stock they can hold in a single company (Apple). This fact by itself limits severely the buying power available for Apple stock. If Apple begins paying a dividend a lot of institutions that can’t buy Apple due to no dividend payout will look favorably towards buying the stock. That’s new buying power plus a lot of individual investors will look favorably at Apple that passed before due to no dividend. Apple has all this money and uses a very small amount of it for acquisitions. It’s very strange. What did Steve Jobs have in mind by accumulating all this money???? It’s a mystery to me. Maybe he just wanted to see how much money he could accumulate before he passed. “Apple is not exactly hurting for cash; Cupertino revealed last month that it’s sitting on approximately $97.6 billion. But rather than burning those funds on acquisitions, half-baked technology, or iPads for all, Apple chief Tim Cook insisted Tuesday that the company is very practical about its money. That being said, Apple isn’t just lounging in piles of gold coins Scrooge McDuck-style. Cook said Apple has spent billions on its supply chain, acquisitions, intellectual property (sorry, Samsung), infrastructure, and retail stores. “But yes, we still have a lot [of money],” Cook conceded. One of the remarkable features of Apple stock is that it’s currently selling at 14 times trailing earnings and probably selling around 9 times forward earnings. This is EXTREMELY low valuation for a stock that is growing at double digit rates every quarter for years. As I said, the buying power is limited in this stock and that “may” be one of the reason why it is valued so low. There is probably a lingering feeling that with Steve Jobs gone, Apple will turn into tomorrow’s wasteland. The fact is that Steve left many, many years of projects in the pipeline. Also the entire mindset has changed at Apple (thanks to Steve), they now think differently than any other company. They aren’t followers like Microsoft and others like Samsung who is busy stealing Apple’s patents. Apple is now the leader of the pack and they think like winners. Another reason for a low valuation is the nagging fear that another recession/depression is coming. Most people view Apple as a technology company, which they are, but they are more correctly thought of as a end product consumer oriented stock. As the consumer pulls back in their buying habits, the thought is that Apple has to suffer also. The problem with that thinking is it hasn’t been true in the past. For instance when the economy went into a slowdown in mid-2011, Apple rolled right along at high speed. Apple’s uniqueness keeps their sales going when others are suffering. If the day comes when Apple loses their edge, the PE ratio that they carry presently will become reasonable but until that happens they will continue to surprise all of the naysayers. Have you wanted to buy Apple but you kept waiting for a meaningful correction??? Yup, you and millions of other people are in that category. If you look at the charts for Apple in MY CHART LINK , page 31, you’ll find that Apple has a history of declining down to the peak of a prior high. It has done this repeatedly. For instance, 2007 to 2009, Apple declined from slightly over $200 to approximately $80. The $80 level was the peak made in 2006 followed by a small correction. This correction was followed by Apple’s almost uninterrupted run to the $200 level. If we had a large recessionary correction in the market at this time, I would expect in a worst case scenario that Apple would correct from the $500 level to $200 (2007 peak price). More than likely it would stop at one of the other peaks like the $360 level made during 2011. So watch those peaks for future support levels should Apple come under attack. But I don’t really expect much in the way of a correction as long as the economy holds up. The economies strength is surprising a lot of people as many are still predicting a recession in 2012. But a lateral correction may be the worst that we will get until something very unexpected takes place (black swan event). In the growth stock section of my charts (Apple, page 31), I have just added moving average lines, purple and gold. These are called the “Guppy Multiple Moving Averages”. You can read these chart lines using the tactics outlined below. These lines form an easily seen visual oscillator. 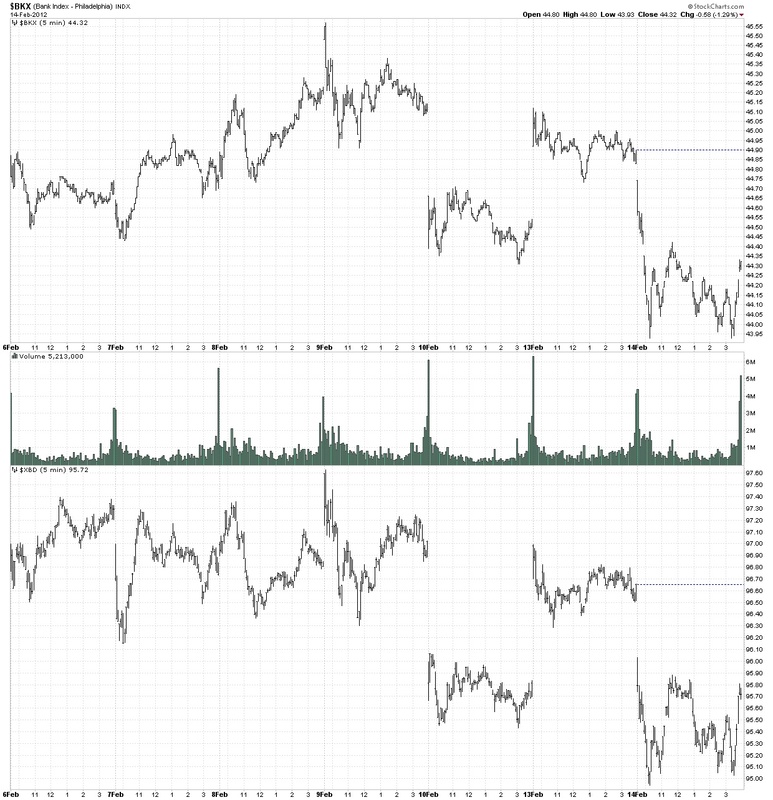 Extreme points in the moving averages produce the same extremes in the oscillators that appear on each chart. 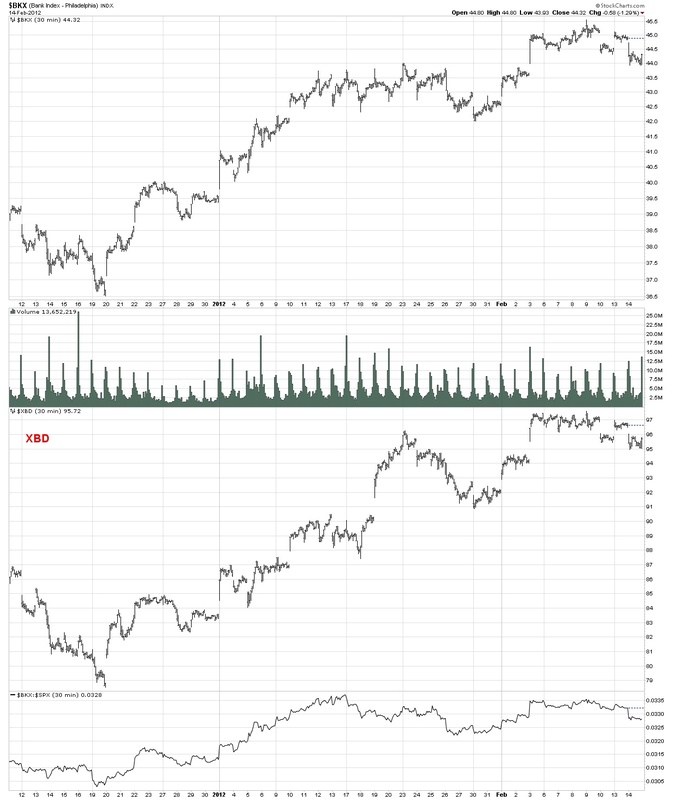 This makes it easy to quickly follow overbought and oversold points of reference. Apple stock chart from page 31 (daily view for the last 18 months). Wow and I had only intended to say a few words about Apple. Once I get started I don’t know when to shut up. But now you know the rest of the story. I haven’t issued a sell signal recently and don’t expect to do so anytime in the immediate future. We’re going to ride the wave until the saw-tooth develops or I get too hyper to sit still any longer (it happens). In one of the mechanical signal methods used on page 1 of my chart link, chart number 10.8, we are very close to a sell signal. With paper profits of about 100 points in the SP 500, this method is going to have a very good trade for its first transaction of 2012. In the real world of my interpretations, I believe that we could have one more upthrust with new recovery highs before a correction takes place. Until that happens, we may not see any real signs of a correction but I’m receptive to a correction beginning at any moment. I still believe that my “no more buying” was the correct move but it may not be readily apparent for another week or two. If the correction comes, I will issue a renewed buy signal at the conclusion of the correction. I have had several qualified buy signals in recent months (since Oct 4th). We have had an irregular market since my last “don’t buy” update. We aren’t really going down, more of a sideways to up market depending on what index you are watching. Tuesday I thought we were going to start something but it aborted at the end of the trading day and traded back up to close little changed for the day. I had gone short early Tuesday morning and closed it out after the small 3 step down showed a little too much life on the upside for me. Made a little money but its a risky trade and I very definitely don’t recommend that sane people trade against the larger trend. It’s one of those axioms, don’t trade against the larger trend. It’s very sound advice but I’m a little crazy (not as bad as I used to be) and hence the risky short position taken early in the day. It could have very easily gone against me and I would have lost money. I have been establishing a new position in a stock (a stock???). I do own a few but I normally buy/sell SP 500 futures contracts and roll them over as they expire for any longer term holding periods. The stock that I have been slowly buying is Linn Energy (LINE). It’s considered a long term holding and I’m tranching in as a conservative entry point. The current price has a dividend payout of 7.7%. I had already mentioned LINE in my last comments and won’t bother to say anymore. Meanwhile I had said that I would get back on board when the Nasdaq Composite resumed its relative strength. It has resumed its strong relative strength position but I I lied because I haven’t given an all clear for buying. The COMPQ has resumed an irregular higher move but once again it has showed a topping formation over the last four days, which was destroyed on Wednesday. It did this before when I warned of not buying and that also proved to be a false alarm in the Composite Index. I’m going to be conservative and not put the buy flag out yet. Any one who is nutty enough to listen to me in the past should have bought a long time ago and should only have been adding to these positions with new money as it became available. Right now the bank is where the new money belongs. It’s possible that we may get one more push into new recovery ground before a correction begins. The chart below shows that we have completed 2 steps up (red 2 at top right) since December 19th. When the 3rd step up is completed, we can correct. Overall, we are only in a larger 2nd step up (black 2 of 2) since the October 4th bottom. 1st step up (blue 1) ended in late October. Since then we have been in a larger step up (blue 2 not seen on this chart). If the count is correct, we have much further to go before the final top. That top will end the bull market, which began in March 2009. Did your eyes glaze over with that last paragraph??? Don’t worry, everybody always says, “huh” . . . what did you just say???? I think the concept is simple but explaining it in words is difficult and completely BS to understand. It’s one of those, a picture is worth a thousand words. The minutes from the most recent FED meeting have just been released today and the stock market was unimpressed and selling off. Maybe the correction has begun. I have seen so many false starts in recent days that we have to wait and see. This market has been impressive on the upside with high persistence and continuing momentum. The Nasdaq Composite index burst through the upper red circle today (Wednesday). These topping formations seem to be built so they can be destroyed quickly. We are continuing to enjoy the ride but all new buying is deferred for the moment. The semiconductor index is showing poor relative strength and is often an early indicator of market turns. It clearly shows two steps down but in an eager bull market, we often only have two steps down with a truncated third step. That may be possibly indicated here and a higher high than 5 days ago will prove that case. The technology index stocks are showing good strength with a new recovery high today. That is certainly not an indication of any corrective type action. This index has been in a solid uptrend since the December 20th bottom. The banks (BKX) and the securities broker/dealer index have been acting poorly but show 3 completed steps down. 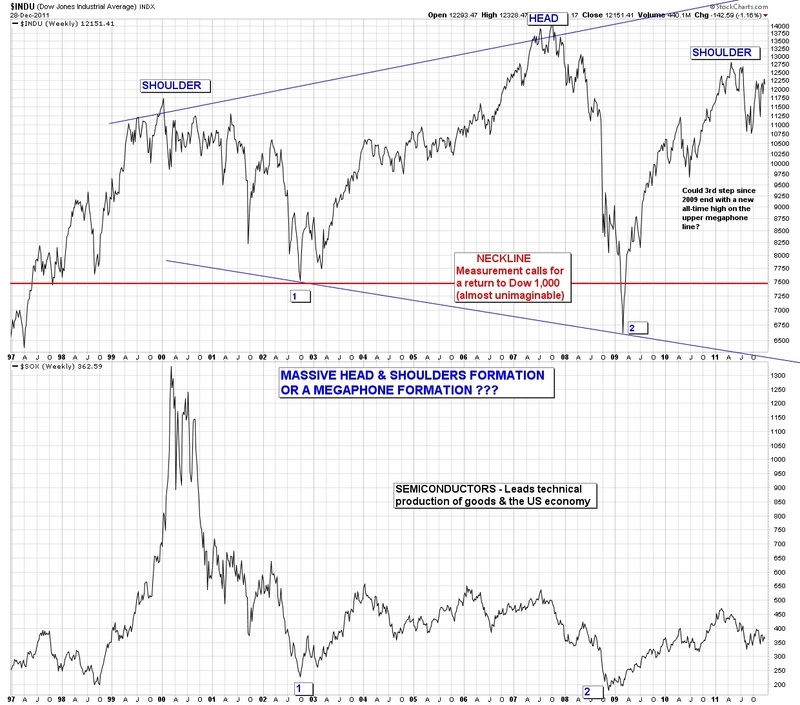 If true, this indicates a good rally is forthcoming in these indexes. The only monkey wrench would be a 4th & 5th steps down, but with the underlying strength in the overall market, that doesn’t seem likely. The Russell 2000 index (RUT) has been declining for several days, but today formed a higher low and all that is needed is for a higher high than Monday’s close. If today’s late rally carries over into tomorrow, we could easily best the Monday close. The SP 500 (SPX) has been going nowhere for the last week, but if you look closely at this chart you will see a reverse head and shoulders formation (bullish formation). The left shoulder is last Thursday, the head is Friday and the right shoulder is today. A break of the neckline (the highs across the top of this chart) would validate this formation and call for a move upward of 17 points above the neckline at approximately 1354. A target would be about 1371, which is precisely at the level of the May 2011 high. The DJ Transports have been in a downtrend for more than a week. The late rally today did very little to change that outlook. 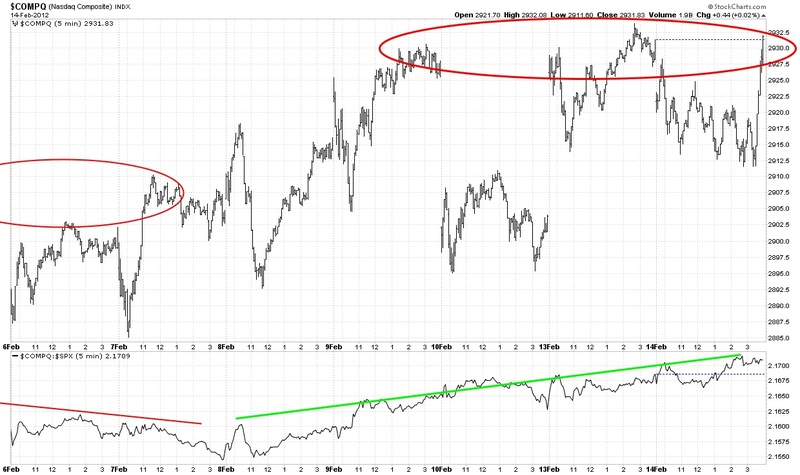 A longer view of the Canadian blue chip index (TSX) has formed a double top and declined since the second peak. I would count this as somewhere in the second step down, where the first step down was between the double tops. Second step down began immediately after the second peak. 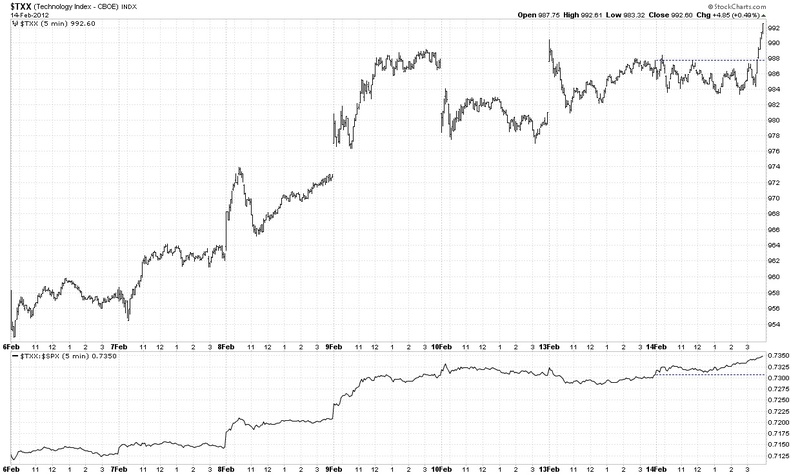 I like watching the TSX as it has less “noise” than some of the American indexes. Institutions of all sorts have a temporary distorting effect on the American indexes. Consequently the distortions can make counting steps more difficult in some of the indexes. This is the reason why I have 10 indexes on each page with the same chart period. The hope is that one of these indexes will have a clear picture of what’s happening. Frequently that’s true but when its not, my life becomes more difficult. 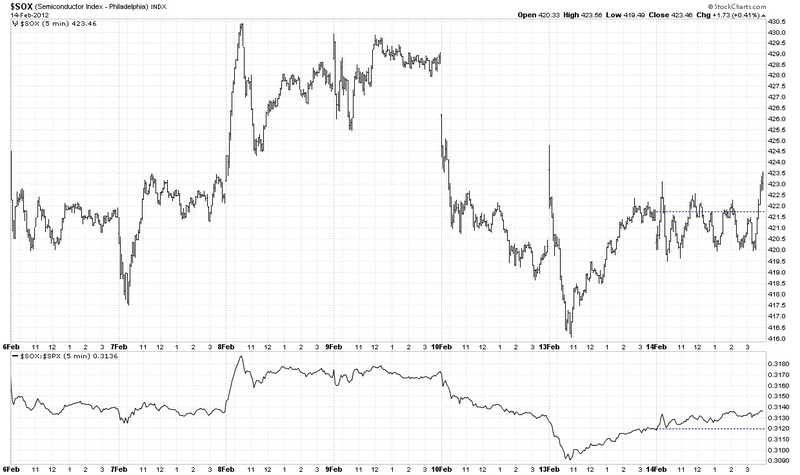 The 30 minute TSX chart shows exactly what has happened since the December 19th bottom. This index formed a bottom on December 15th. 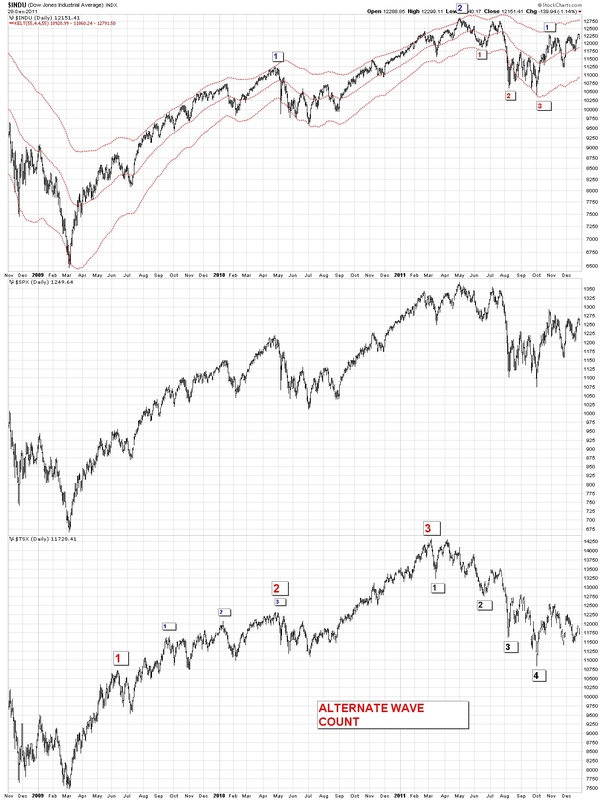 Nice leading motion by the index showing the way for the bottom on the 19th. You can see that the index counts very nicely since the December bottom with an obvious channel break taking place since the first peak on January 26th. The red Fibonacci levels indicate possible stopping points on the way down. Any correction that turns up before it makes it to the 38% level must be deemed strong and eager to go up. We’ll see what happens here, but I could make a case for a 3 step down since the second peak on February 3rd. 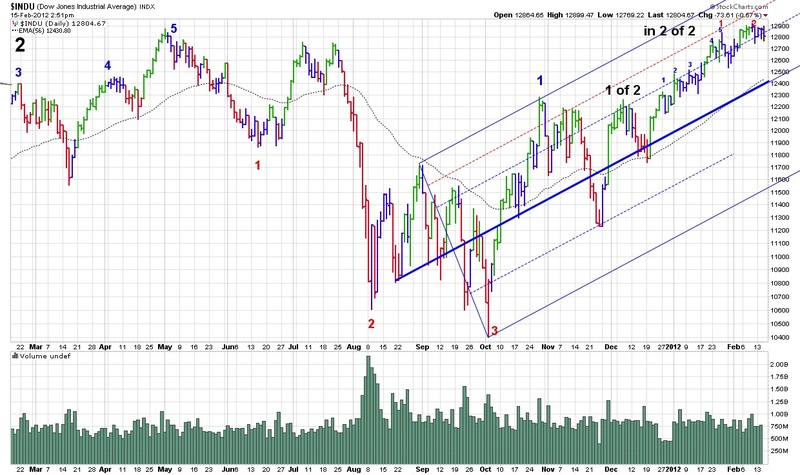 Notice the nice channel that has formed since the December bottom (blue dotted lines). We also have in red, the speedlines based on earlier market action that shows the most recent peak in this index taking place precisely on one of the speedlines. This is not an infrequent occurrence when you have a valid speedline. 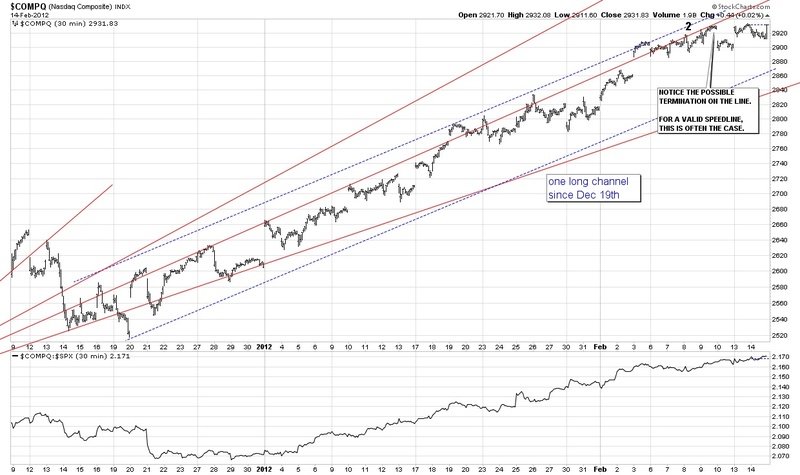 This index illustrates the strong and well confined channel that has been in effect since the December 19th bottom. 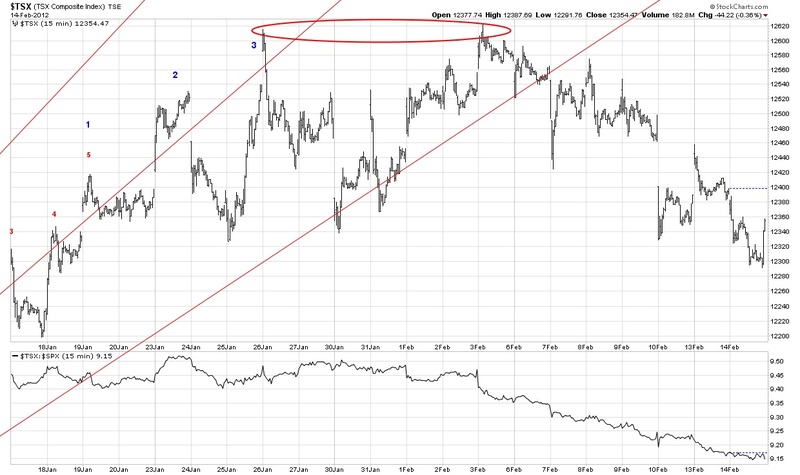 Counting the steps in this index is not clear and is a perfect example of an extended uptrend where counting the steps has become next to impossible in real-time. This is where the channel break tells you when the step has ended. My theory is that when you lose track of the steps on the up or downside, the market move is an extended primary move. Counting the steps will be a lot easier when the channel break takes place, but for now we rely on the channel break, which doesn’t exist yet. The next chart which is for the same time period as the TXX chart above is the banks (BKX) and securites broker/dealers (XBD) and it shows a rather clear 3 steps up since the December 19th bottom. 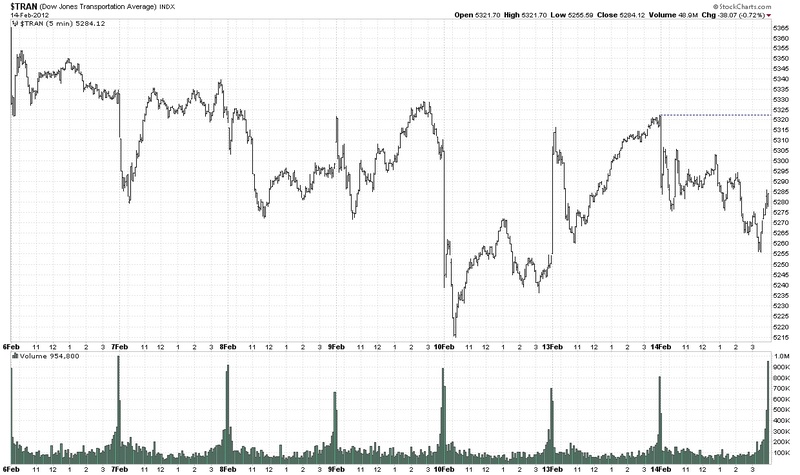 A perfect example of why I have 10 indexes on each page for the same chart period (30 minutes). A lot of people have become more bullish in recent weeks and that often precedes a temporary reversal, but this indicator is notoriously wrong in the later stages of a bull market. The period leading up to the 2000 bull market peak was an excellent example of rampant bullish behavior but no correction until the market had expended the buying power available. When there is no one left to buy because everyone has spent their money, you are only left with sellers. I remain in an “overall” uptrend theme as per previous updates. That means zig-zag not straight lines. Told you this was a windy comment. I can really bore the crap out of you if I start talking about the stock market. But I have learned to restrain myself because nobody loves this stuff like I do. Talk about it for a couple of minutes and then stop. If they want to continue the conversation, they’ll tell me. But you guys are a captive audience (maniacal laugh here). Only in 1999 did everyone want to talk about the stock market and I was telling them to sell, not what they wanted to hear. Also nobody wants to buy when there is blood in the streets and nobody wants to sell when everything is so good that making money in the stock market is a sure thing. I always like to say “Don’t confuse genius with a bull market”. Nobody understood that in 1999 and they thought they had learned more in a short time than I had since 1957 (they were thinking this guy is really dumb!). I have made peace with this attitude and always expect it. I don’t even say later, “I told you so”. Usually the person will say it for me. Never forget that the driving force in the stock market is emotions and those primary thoughts are “fear, hope and greed” as displayed in the following chart. This entry was posted on February 15, 2012 at 8:40 PM and is filed under IN DEPTH, UPDATE. You can subscribe via RSS 2.0 feed to this post's comments. You can skip to the end and leave a response. Pinging is currently not allowed.